Scheduler: How to call/run an external batch file? Hi - I am trying to run an external batch file process after Omniscope Server Scheduler has opened and saved an Omniscope IOK file. 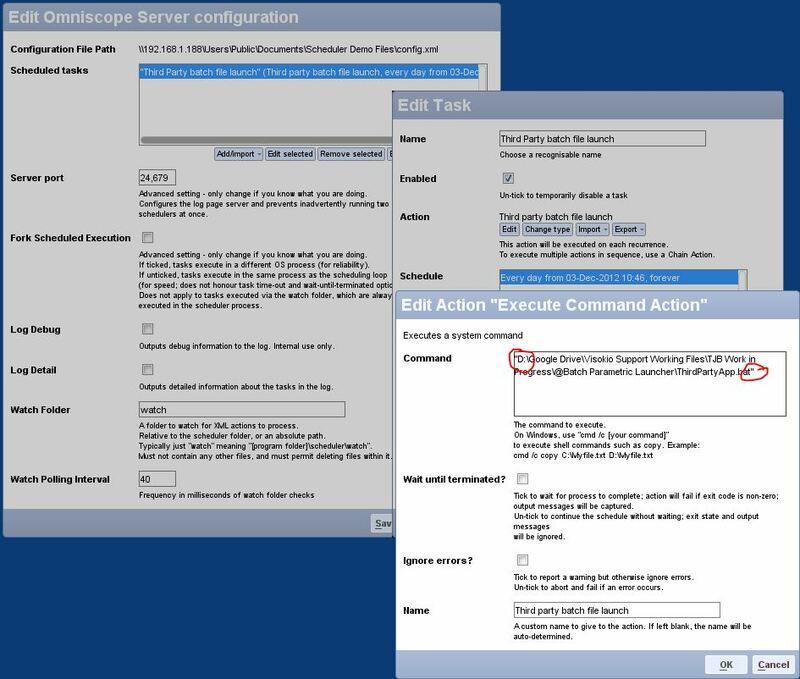 Is there any way to do this in using the automated Omniscope Server Scheduler Task List actions? I have been trying to use the Command action but this does not seem to work ?? Ben - Command action should work...most common oversight is to forget to enclose the path to the batch file in quotes if there are spaces in the path? Hi - I keep getting an error which relates to a class i am calling/using within the batch file. The error message i am getting is : "Could not find or load main class file SendFile"
However if I just click on the batch file myself i do not get this error , yet i get this error when i try to open it using the command action in Omniscope. Any ideas why ? It sounds like you're trying to start a Java program from a different working directory such that the classpath is incorrect. You should be able to invoke the BAT file directly from Omniscope. But you may need to put a "cd \path\to\bat\folder" line at the start of the BAT file.